Within this paper we examine the use of extended story turns, within the accomplished context of a radio news debate, that display various accounts of national identity in relation to a proposal for devolved democratic institutions within the United Kingdom. In this sense, they display a 'world view'. These various positions are displayed through the use of various categories, inferences and connections in order to lend support to and promote positions of For and Against the proposal of the establishment of a devolved democratic assembly for Wales. In this sense the topics of national identity and political re- organisation are omni-relevant topics (Sacks 1992). However, our particular focus and interest is upon the various detailed ways such positions routinely rely on methods of categorisation and moral assessment in their construction, configuration and promotion of arguments. Furthermore, the analysis of such category work contributes to our understanding of the moral organisation of Welsh identity in relation to devolved forms of political organisation and representation. In recent years questions surrounding national identity have received much sociological attention (Delanty, 1996, Treanor, 1997, Rex, 1996, Achard, 1993, Fevre and Thompson, 1999). Routinely, this attention has focused upon the relationship between national identity, social structures and processes. However, whilst some focus of research has been directed towards the micro-dimensions of nationalism and national identity (Billig, 1995) and national identity and discourse (Condor, 1999) very little sociological attention has focused upon the manner through which such relevance's are produced, recognised and used within the realms of everyday interaction and the micro-sociological dimensions of institutions and their associated practices. During the course of this paper we utilise some principles of membership categorisation and conversation analysis (Baker 1984, Hester and Francis (forthcoming), Hester and Eglin 1997, Housley 2000, Lepper, 2000, Silverman, 1998, Watson 1978, 1997) in order to provide an ethnomethodological reading of the accomplishment of different accounts and forms of argumentation within a political radio debate. This debate concerns the topic of devolution and the establishment of the Welsh Assembly. The setting examined in this paper provides an interactional context within which the social organisation and accomplishment of political positions and opinions in relation to national identity can be explored. Whilst it represents a single case analysis it is our contention that such an analysis, in conjunction with others, provides a plethora of thick description that opens up new forms of enquiry and analysis into an area of study that has not received as much attention as it might. However, in recent years a number of studies have began to explore the interactional accomplishment and display of national identity within a number of settings (Hester and Housley, 2001, Rapley and Augoustinos, 2001 Widmer, 2001, Leudar and Nekvapil, 2001). These studies have employed various versions of Harvey Sacks membership categorisation analysis (Sacks, 1992,a) in order to examine the interactional specifics of members work in accomplishing and organising identities in terms of 'national' deviced based properties. Within the data examined, in this paper, we can observe a number of characteristics associated with the organisation of talk and interaction within broadcast settings (Hutchby, 1991, Clayman 1992, Housley, forthcoming). For example, asymmetrical turn types between the interviewer and the interviewee, footing techniques, methods for generating debate and formalised question/ response turn allocation have all been identified as important aspects of talk-in-interaction within such settings. Whilst these are important features of such settings the analysis here focuses on the specific, particular and local accomplishment of forms of argumentation, description and boundaries-of-relevance configured around issues of national identity and proposed political reorganisation within the United Kingdom. As much of the literature surrounding radio news debates demonstrates, participants usually respond to questioning via extended turn types (Hutchby 1991). Furthermore, much ethnomethodological analyses of talk and interaction have examined the character of extended turn types in terms of story organisation and accounts (Sacks, 1992 a, b, Lynch and Bogen, 1996, Hester, 1994, Housley, 2000). Stories and accounts can be understood to be organised in terms of a story opening (preface), the story proper and story closings. The story proper consists of a designed collection of categories, which are chosen or displayed in order to facilitate and realise the design potential of the story, such designs may resemble Sacks' (1992a: 299) description of 'request formats'. Request formats may consist of a story in which the categories displayed within the story proper facilitate and 'point to' the information that the 'story teller' wants to be heard. Such a method exhibits Sacks' observation that stories are primarily designed, as a conversational format, for the listener. This 'recipient design' means stories are deemed newsworthy for the members present and concern themselves about something in particular. A story teller ordinarily is granted a certain right of ownership over details of hise or her story and the plausability and coherence of such a story necessarily turn on the teller's claims to have experienced the events being told. How the teller experienced these events - as a storyable matter - has to do with the teller's unique access or 'entitlements' to those events. Numerous conversation-analytic studies have examined stories in conversation and their constituent structures. In the present study we focus more on issues of narrative design, moral entitlement, and the social distribution of stories; these are themes that also were central to Sacks' work on stories, but they have been given less attention within conversation analysis... The storyteller's presence in the story goes well beyond specific mentions of ego and of subjective meaning. For example, the selection of predicates to describe and juxtapose scenic details, the temporal ordering and sequencing of narrative phases, and the grammatical tense of the story all serve to establish the teller's place within events and to provide grounds for inferences regarding what happened and what its significance might be. Story tellers commonly deploy spatial and temporal predicates that are relative to the teller's and audience's past and present relations to the events in the story. Stories can therefore be understood to be deployed in a variety of settings during the course of a number of activities. However, stories have been routinely shown to be part of a methodological apparatus deployed by members (in and through category and sequence in talk) that accounts for events through various discursive modalities (e.g. moral assessment, description or the sequential placement of an extended turn). Furthermore these 'assemblages' are often oriented towards the interactional accomplishment of specific forms of moral categorisation and inference (Jayussi, 1991). The data analysed in this paper is taken from a simultaneous BBC TV and Radio 4 morning broadcast (18:05:99) concerning the proposed establishment of a devolved Welsh 'Assembly' prior to the referendum on the matter in 1999. The incoming Labour administration of 1997 had committed itself to a programme of devolution, to varying degrees, for the constituent parts of the United Kingdom. In practice, the proposal of devolution meant the ceding of some powers of decision making from central government and certain quasi-autonomous non-govermental organisations (QUANGOS). The power of Quangos in Wales was viewed as contributing to a considerable 'democratic deficit' within the principlality. Unlike Scotland, who had the choice of a Parliament with some tax raising powers in the proposed referendum, the Welsh Assembly was not to be responsible for taxation and could therefore not raise revenue. The proposed institution was to be responsible for health, education and other matters. The Assembly, it was argued, should be an elected body that was to be accountable to the people of Wales; unlike previous forms of governance within Wales that had been popularly viewed as a form of colonial administration. The referendum campaign and it's coverage in the Welsh Media provided an excellent site for exploring issues related to the accomplishment, display and contestation of national identity within the context of a debate surrounding some measure of national self-determination. The programme is a 'phone-in' with a single topic for discussion and consists of a host and two guests present in the studio with callers being invited to phone in and give their opinions on the topic and debate with the guests. Within the introduction of the programme the host has topically positioned the guests into two 'opposed' camps i.e. one side being in favour and the other not in favour of devolution in Wales. Furthermore, the guests do not just hold these contrasting opinions, indeed they have been actively involved in the political campaign for their respective points of view. Our analysis of this event is concerned with the way participants construct narratives in order to promote their views and defend those views when challenged. In the following extract decentralisation and nationhood are topics that are constituted within an extended turn format. This can be understood as a kind of categorially organised 'policy equation', Namely, devolution for Wales. The issue for the guest (G1) is that the proposed Assembly will interfere with the political balance of the status quo in two principle ways. Firstly, through the creation of conflict between the 'nations' making up the United Kingdom and secondly through the dis-empowering of local democracy within the nation of Wales. Initially, G1 characterises the causal device of decentralisation by refering to the notion they 'see no way in which that that will not lead to national conflict' (L.01). In this way, the practice of democracy is tied to the device of a 'centralised United Kingdom' whilst the result of the proposed decentralisation of this democracy is mapped to the predicate of 'conflict'. Thus, in this stretch of talk, decentralisation as a democratic process leads to national empowerment (through the setting up of democratic structures) which is then tied to inevitable conflict because of this very self same democratic process. The narrative continues through further characterisation and description work. In this case the proposed Welsh assembly being likely 'to usurp powers further'. That is, the future actions of an elected institution are predicated in terms of 'usurping powers'. The recognisable tension between the descriptions here can be understood to be achieved through a particular form of category juxtaposition. The juxtaposed tension is produced as a result of democracy with empowerment at national level (leading to conflict) being contrasted with dis-empowerment at a local level (leading to loss of local democratic control). Thus, in this way the devolution of democratic accountability in Wales (i.e., from management by central Government to one where responsibility is passed to an elected body within Wales) is one that is portrayed as dangerous and treacherous at a number of levels. As suggested earlier, the account morally contrasts local democracy (safe) with the emergence of national democratic representation at the Welsh level (unsafe). Indeed, local authority workers and councillors are described as 'fearful' (L.05) about potential reorganisation. The proposed assembly is then described as a talking shop that will be primarily oriented to interference with local democracy. Thus, democracy is legitimate at the level of the United Kingdom and the local level but morally dangerous and problematic when associated with the national identity device of 'Wales'. Modes of predication that tie democracy to Wales are constituted in terms of conflict, the usurping of powers, promoting fear amongst sections of the population and interfering at the local level. This story is therefore one that is constituted in moral terms. Different categorical configurations of democracy are contrasted as a means of downgrading configurations within which democracy, devolution and Wales are co-flated. During the course of the following extract the second half of the policy equation is discussed by G1, namely the national identity device Wales. This extract comprises the second part of the response by the speaker (G1) to two points raised in the previous question. In this case, whether the diversity of Wales presents problems to ideas and policies committed to a single political devolved entity. As a story it conforms to Sacks' notion that stories are characterised by a preface, the story proper, and closing. The preface can be heard at line ten. We are informed that the topic of diversity is about to be addressed and that an asymmetrical extended turn is about to be taken. The story proper is introduced through a provision of a description of what follows as something that is 'interesting' (L.11). After the provision of the story proper the speaker provides a closing utterance that includes a further description of what has been presented (L.22) and contextualises the argument/narrative as something that is possessed by a recognisable collective (i.e. that is our worry). Within the story the topic of diversity is used as a resource for problematising the proposal for devolution in Wales. Through further analysis of this story it is possible to explore how the speaker builds his argument against devolution through the construction and use of this topic/device. That is, the device is used as a resource for a particular practical deconstruction of the national identity device 'Wales'. In the first instance, the device of 'Wales' is connected to two membership categories, namely 'North' and South'. In terms of our membership of this category we hear this not merely as a geographical category but as one through which further predicates may be tied (e.g. relative to population there are a greater number of Welsh speakers in the North of Wales than the South). This mode of predication is displayed in Lines 11-12 when North Wales is tied to a further category 'Welsh speaking Wales'. Furthermore, we are told that members of these specific categories of the device 'Wales' voted 'just as heavily against devolution' as South Wales during a previous referendum on devolution in 1979. The co-flation of North Wales with 'Welsh Speaking Wales' is one that is contestable. For example, it does not include West Wales or parts of South Wales that have a significant number of Welsh speakers. This categorial display and set of linkages is then presented in another format (L.13). We are told that the inferences that can be made from these linkages is that the argument that a vote for devolution is an expression of national pride can be understood to be 'peculiar'. In many respects this is an insertion of a 'red herring' with respect to the local specifics and topic of the talk. However, it does display a sense of Wales and Welshness within which Welsh speaking is translatable into a state of possessing more national pride than non-welsh speaking (national pride being mapped to linguistic pride). The fact that North Wales, 'Welsh speaking Wales', voted against devolution in 1979 as heavily as South Wales is used as an argument with which to make unwarrantable the claim that national pride in being Welsh should be associated with voting for the 'Yes' campaign in the forthcoming referendum on devolution. However, at the heart of this categorical display are forms of categorisation within which the ability to speak the Welsh language is tied more positively (closer) to the membership of the device of 'Wales' than other forms of linguistic practice. This is the first move in building the speakers argument against devolution in Wales through the use of diversity as a categorical resource and device. The speaker continues through further use of the diversity device. We are informed that the situation in Wales is 'much more complicated'. In one sense we may understand complexity as a device of organisation to which diversity can recognisably belong. It at this point that the main part of the story, the news of this rebuttal account, is delivered (Lines 15, 16). The speakers states ' ...we don't have a simple ur unified sense of identity'. The sequential location of this utterance is, we believe, significant, in terms of the character and practical logic of the argument. Diversity needn't be a problem, indeed, hypothetically, it may be argued that diversity is a strength and that devolution, as a principle of political organisation (rather than nationalism per se) not only accommodates this but is also a product of it's recognition (i.e. devolution being a recognition of an aspect of diversity within the United Kingdom). However, the sequential positioning of the utterance, as well as the categorical linkages and display that get us there, sequentially reaffirms the use of the diversity device as a tool for problematising both Wales and devolution. The sequential positioning of the utterance affirms the categorial use of diversity, in this instance categorically recast as fragmented identities, as a resource to problematise the relationship between Wales and devolution. Thus the existence of many Welsh identities and the method of narrative through categorical description, elaboration and proliferation is used to downgrade the category of a coherent Wales and thus the political concept of Wales. The fact that the device, 'diversity in Wales', can be tied to many categories and is in fact, category rich, is used in an attempt to enframe and constitute the national device 'Wales' in a specific way. In this case, when tied to notions of democracy and representation it is presented as fragile, as opposed to, say, support of sport teams, cultural events, pop music and so forth which might be cited as more cogent categorical orders where the national identity device of Wales and Welsh is not problematised or contested. '... a lot of us feel we've got more in common for example in industrial South Wales with say the people of Newcastle. This is our worry' [L.21,22]. Through the use of this category construction the speaker is able reinforce the problematic narrative of devolution by placing himself as a member of a category group in which similar features are co-constituted. This elaborates the fear of concerning representation and the Assembly by providing an illustrative category of people, namely 'us', who as a category of population have more in common with others in similar economic (as opposed to ethnic, political, civil, national or linguistic) circumstances. Thus, whilst not necessarily including ourselves in the category he nonetheless provides a means of categorical reflection upon our own possible category dis-junctures with the national identity device of Wales. More specifically, the use of and inclusion of the speaker within this category is offered as 'an example', an example which invites the listener to place themselves in the same frame, though not necessarily making the same connections as the speaker. This categorical manoeuvre may be seen in terms of what Sacks refers to when he suggests that 'talking about whatever, it comes home to us' (Sacks 1992: 563). What Sacks suggests is that we talk about events in so far as they happen to us and affect us, we place ourselves in the frame of the story. Moreover, the use of the personal category membership for 'him' within this part of the narrative is constructed in such a way as to invite us to place ourselves in the frame to see how events will affect us. Thus, a personal category identification is offered as a device to which listeners may, upon their own personal categorical reflection, include themselves or not. That is, the listener is being offered a device frame within which they can reflect upon identity groups with common interests to them but which are not in Wales. In summary of this section, within the course of this story the existence of many Welsh identities and the scope for diversity is used to downgrade the proposition for devolution in Wales. Thus, through the provision of category complexity, the notion of a unified Welsh identity is deconstructed and the proposal for devolution as an expression of national self determination is downgraded through the problematisation of the second part of the policy equation, namely the device 'Wales'. This is displayed through an account that asserts that Wales is characterised by a number of identities as opposed to a single or uniform cultural or national configuration. Therefore, as stated previously, diversity is constituted as a problematic category for devolution in Wales and is used a resource to downgrade and problematise the proposal. Geography, Identity and Warrantability: Using Hierarchies of Categorisation in Debates concerning National Identity and Devolution. In this section we develop the discussion of categorical work in a political debate by examining the way identity and geography may be tied to a notion of warrantablility to speak on a topic. Of particular interest here is the suggestion by a caller that her category membership precludes her from offering an opinion on Welsh devolution and subsequently the way the guests then set out to configure the topic as one of inclusion or exclusion of her category. In this way, the local categorical membership and predicates of the caller becomes a political issue approached by the guests through configuring hierarchies of category membership. In the first utterance by the caller she offers an answer to the omni-present question that the programme is premised upon. For the caller, the vote should be 'no' to devolution. Thus, the caller at this point has placed herself into one of the opposing 'sides' of the debate. Having now given her opinion she then begins to offer an account for why she holds this particular view. However, before finishing the first point she has embarked upon she suggests that 'they' (we suggest that the 'they' refers primarily to the two guests but also to their supporters and possibly in the broadest sense, all those in Wales) might question the legitimacy of her having an opinion on this topic because of her geographical location. Thus, although she rings the programme, gets on air and offers an opinion she suggests that her opinion may be seen as unwarrantable because of her category membership. That is to say, she suggests that she does not occupy a relevant category for this topic, which presumably would be someone from Wales and that because of this, her opinion may be unwarrantable. In this way, the caller offers a view of the debate in which warrantablility to speak within the debate is organised in terms of geographic categories. The caller then continues with a point about the accountability of the Secretary of State for Wales in relation to a Westminster Parliament and her concern with the self serving nature of appointments to quango's in Wales and the 'separation' of Scotland and Wales from England. The point the host picks up on to initiate debate with the caller is the geographical location of the caller and the legitimacy of her having an opinion. Thus, although she has provided some footing concerning possible characterisations of the opinion she has concerning Welsh devolution, the host's question seeks to explore the grounds of her own account that questions her legitimacy to speak due to her self professed 'problematic' geographical category incumbency. For the host, she has not provided a reason as to why she feels she, as a member of a category incumbency that may be seen as an irrelevant position for this topic, should be seen as having a legitimate opinion. The host's question reformulates the category membership of the caller by placing the caller's, 'I live in Norfolk' to 'someone from Norfolk'. Consequently, the caller's self-proposed problematic category relationship to the topic is not treated as a matter peculiar to Betty Lawson but in terms of the caller as a member of the category device of 'those who live in Norfolk'. The reformulated category device 'anyone from Norfolk' subsumes the individual category membership into a generalised device. (L.78, 79). The question is heard to categorise the caller in terms of her geographical location and also her nationality through her geographical position as somewhere that is not in Wales. Thus, when the host asks the caller a 'follow up' question it can be heard as a repeat question, although the geographical term for the caller is now England as opposed to Norfolk having a say in the affairs of Wales (L.84). Building upon Sacks' consistency rule, whereby mention of one category allows further categories to be seen as members of the same device, the use by the host of the categories Norfolk and then England can be seen to build upon the device of geographical areas outside Wales. Moreover, further use of the consistency rule would suggest that as these geographical categories are 1) part of the United Kingdom and 2) not Wales they could also include the categories of Scotland and Northern Ireland. It is not then that Norfolk is in a problematic relationship to having a say on Welsh Devolution, but that Norfolk is a category within the device England and England is a category within the device 'not in Wales'. The topical issue being people within the device 'not in Wales' having a say on Welsh devolution. This topic of warrantability, configured around category membership of political and geographical devices, is then taken up by each guest in turn. 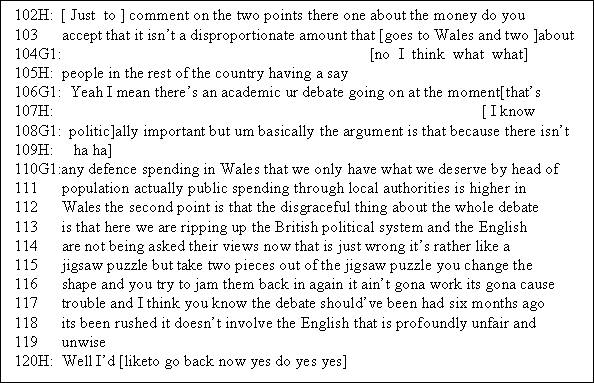 Initially, the answer to the moral problem of geography and warrantability of making claims about the proposal for democracy for Wales is formulated in terms of how much money the countries of Wales and Scotland have had from England (L.87). The question posed by the caller is now put to the first guest. The guest (G2) begins to addresses the caller's question by referring back to a previous caller who addressed this issue, pointing out that differential amounts of money are given to Scotland and Wales and accounting for why this should be so. The guest (G2) then goes onto address the issue of the geographical category of the caller and the apparent disjuncture this presents for a valid opinion predicate being successfully mapped to the caller. The guest (G2) suggests that she has no problem with people from England having a view on Welsh devolution, but that it is the people in Wales who should have an opinion. In her response the guest draws upon the category relevance proposed previously in which a separation between people in Wales and people in the rest of the United Kingdom was made. Within the categorical organisation displayed, she suggests that people in England do not occupy a problematic relationship between their category membership and this topic and that members of this device are welcome to have opinions on the topic. However, what matters to this guest is that members of the category 'in Wales' should also have opinions and it is these opinions which are important. The guest (G2), then, has configured boundaries of relevance around a geographical device whose members are those who are eligible to vote. That is, it is not that Welsh people per se should have an opinion but anyone who lives in the geographical area of Wales, whatever nationality they are should have an opinion(i.e. those eligible to vote as this may include English people who are resident in Wales). Thus the caller's geographical location, turned into a national identity by the host has now been reverted back to a simple, for this guest (G2), geographical issue. 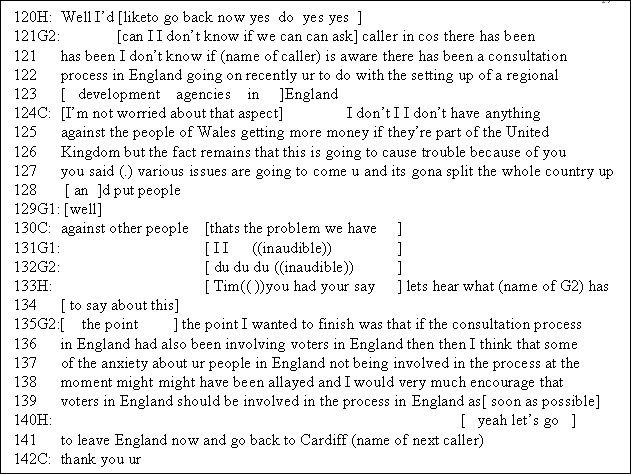 In this way, the guest (G2) is able to use the category configurations of the caller to accept her opinions as valid whilst making them irrelevant as the caller, and by extension all those 'not in Wales', do not have the vote. Consequently, this then configures the categorical relevance to one of agency (those who can vote) and dismisses the relevance of national identity. This story therefore detaches issues of Welsh political identity from questions of notions of ethnicity, language and so forth as relevance to the debate is a matter of predicated agency and residential location. After this the host then invites the other guest (G1) to address the issues raised by the caller. The guest (G1) first of all provides further flesh to the difference in government spending in Scotland and Wales (L.110 B 111) then goes onto address the issue of the grounds for someone from England as a relevant category for a valid opinion. For guest 1, (G1), who occupies a position against devolution, the issue does involve the English, not in a peripheral capacity, but as a part of a device with a central concern to this topic. For this guest the issue concerns not just those who live in Wales, and by category extension have a vote in the forthcoming referendum, but those who live within the device of the British political system. This particular form of political organisation subsumes the geographical organisation of the British Isles and Northern Ireland as relevant to the debate and thus now includes the English, and by extension the caller, as relevant and having a relevant and valid opinion. Thus, the category of the caller in relation to the relevance of Welsh devolution is now intimately connected with the topic, such that geography is turned into political geography and in that sense the caller's nationality is made relevant to the debate. The caller then, in one sense, has now been categorised as part of a device (the British political system) which is of central importance to this debate. Indeed not to recognise this has been 'profoundly unfair' to the English. Thus, the reconfiguration of category topic relevance is achieved whereby the national identity of the caller is made as centrally important to the debate as people who live in Wales. In response to the reconfiguration of category relevance that now include the caller's category incumbency the other guest (G2) requests that she be allowed to bring the caller into the discussion to ask whether she is aware of consultations going on in England concerning the setting up of regional development agencies. In response to Guest 1's discussion with the caller Guest 2 requests that she be allowed to bring the caller into the discussion to ask whether she is aware of consultations going on in England concerning the setting up of regional development agencies. This then, offers a relevance to the caller within her geographical location. The caller however dismisses this going on to address her previous question concerning the allocation of spending to Wales (L.125). She now says she has nothing against the people of Wales getting more money, if they are part of the United Kingdom, thereby once again invoking the categories of political geography and the possible outcome of this for the United Kingdom. At this point Guest 1 attempts to gain the floor shortly followed by Guest 2 who is then followed by the host allocating next turn position. Guest 2 asks that she be allowed to finish her original point embarked upon in the previous turn. This point again attempts to address the issue of the relevance of the caller's category to this topic by appealing to a consultation process that should have involved the English but did not. This is not however a consultation process concerning Welsh devolution but one involving the English in setting up possible regional development agencies. This can be understood as a reconfiguring of the topical relevance of the caller's category incumbency back to a position of peripheral relevance to the topic of Welsh devolution and into a topic which is of relevance to the English and hence the caller. However, it also a means of introducing a further device in response to the notion of the British political system. Namely that devolution is a process that is occurring across the British political system (in one form or another) and is not the sole preserve of Wales. Furthermore, this form of argumentation extends and develops the notion of a form of political identity in Wales that fuses conceptualisations of nationhood and democratic accountability not with Welsh Speakers, ethnicity or 'culture' but notions of rights, voting, eligibility (people who live in Wales) and so forth. In short the category of devolved Welsh citizenship is a displayable feature of this narrative. In asserting this point we assume that citizenship is a membership category that is readily available to everyday conversations, debates and so forth concerning political matters. In this sense the notion of citizenship is a readily available analytical category of a democratic political culture. In terms of the issue at stake, time and categorisation can be understood in terms of the past, present and future. To this extent the process of devolution and associated topics can also be understood to be organised in both temporal and spatial terms. In the following extract one of the callers provides an account of devolution and Wales within which associated problematic topics are produced within a frame of 'the future'. During the course of this stretch of talk a particular presentation of a future avenue that devolution will lead toward is displayed. The present political situation in Wales is viewed as unaccountable. This state of affairs is characterised by there being '... too many Quangos'. However, despite the proposal to set up a democratic devolved institution the future is one within which accountability is still not present. The proposed assembly is projected forward in time and predicated in terms of '... little clans of people like you've got in these various quangos now, they are simply ur ur feeding their own interests and it would be a state where Scotland would be on its own Wales would be on its own' (L.75 B 76). This version of the future can be heard to be a continuation of the present set of circumstances. The future is co-flated with the present; devolution as a process is characterised as one that will reproduce the same set of internal conditions of unaccountability. Thus a sense of stability through non- accountability is maintained. This can be understood as a mode of categorisation and predication that invokes a sense of stability through the 'nothing changes' device. This contrasts significantly with the other modes of predication that are also oriented to problematising the proposal for devolution in Wales. Indeed, the self-same caller (L.81 B 82) projects a further future scenario through a comparison with the Balkan conflict. Thus nothing changes is ascribed to Wales from within and conflict, dislocation and people against other people (L.127 B 130) characterises a Welsh future in relation to other parts of Britain. This projection of the future organised around the contrastive device has been noted previously in the paper where G1 seeks to place the assembly in a middle position of causing conflict with nations outside Wales and interference with local democracy within Wales. During the course of this extract an account of devolution and decentralisation within the context of the United Kingdom is displayed. This account is organised in terms of a mode of predication that projects the assembly into the future. This future is characterised by a usurping of powers that, it is inferred, should morally reside within the device 'local authorities'. The moral work is developed through a further mode of predication that is mapped onto the Assembly and the process of devolution, namely 'fear' and 'interference'. Thus, the predicated future for Wales is one within which the proposed Assembly is at odds with local forms of democratic accountability (Lines 7-8) and represents an institutional manifestation (predication) of national conflict. One of the interesting features of predicating an argument in terms of future events is that it minimizes the effects of counter arguments. Firstly, through the everyday commonsense principle that the future cannot be known and secondly that any response (via the principle of recipient design) has to take into consideration and orient towards the specific categorical configuration, predication and articulation of the future displayed by a first speaker. The predication of the future through condensed story formats (Housley, 2000) is an effective rhetorical resource. During this paper we have noted the manner through which stories and description, moral assessments, configurations, predication and so forth are fundamental to the business of argumentation and debate. Furthermore, we propose that talk concerning national identity devices are inferentially rich. Whilst this study represents a single case analysis it is our contention that categories and devices of national identity are not merely casual, abstract or merely local specific forms of categorisation. Whilst we accept that categorisation is local and situated in terms of the accomplishment of the radio news debate the category Wales is contested and accomplished through the invocation of contrasting categorical 'logics'. These logics, if they are to appeal to listeners, the audience or 'public' (a design feature of radio debate talk) are oriented to a wider sense(s) of social structure and organisation. Clearly, national identity is a category explicit resource through which such a strategy can be practically achieved. A primary and fundamental predicate of national identity devices is there character as a population (n category) device. This is an integral and unavoidable cultural feature of such devices. However, it is also important to note how national identity devices, within the debate talk analysed here, are enframed, accomplished and resourced within a local environment. Categories of national identity can be understood as rich categories due to the possibility to ascribe, associate and tie such devices to a wide range of activities and practices as well as subsume other devices (that become membership categories within a device of national identity) within a collection. This being the case, it is interesting to observe the process of category inclusion and exclusion. As noted in example three, the issue of exclusion, inclusion and so forth is mobilised within an accomplished context of relevance. The opinions expressed are again designed in terms of a situated logic of sense. However, the issue of relevance and the speakers' rights on the topic of devolution and Wales is dealt with through the invocation of further modes of categorisation. Namely, in this case, the inclusive device of the British political system is deployed. This is a device that incorporates both Wales and Norfolk whilst those eligible to vote in the referendum on devolution in Wales does not include those residing in Norfolk. Furthermore, the tension between sense and nonsense is a practical concern that informs the recipient design of argumentation. This is compounded within talk where a 'public issue' is at stake due to the fact that different opinions within a debate context are laying claim to the true version of events and realities of the situation. Thus, in understanding this talk and the design and use of various category configurations within argument-narrative the audience is omni-present. Furthermore, the audience is not merely a passive group of listeners. Indeed, they are there not only to be convinced but are also revealed as interested parties through the activity of 'phoning in'. Furthermore, the audience can also be understood to be tied to the device 'the public'. In this sense, the talk about the proposed establishment of a national assembly in Wales can be understood as an, albeit local and situated, accomplishment and display of the public sphere. The sphere is characterised by 'actors' and 'forms of agency' (politicians expressing views, quangos, instutions with 'powers', concerned members of the public phoning in, a radio news debate programme, the audience and so forth.). However, the debate can be understood as an opportunity to furnish the object of the debate with various categorisations, predications and assessments. The centrality and import of categorisation work to understanding, communicating and constituting accounts of devolution and Wales stands in contrast to traditional accounts of the public sphere, politics and institutions. In this sense, whilst it is feasible to identify various structures, functions and processes within a 'public sphere' (e.g. the media, political institutions, democracy) the organic character of the 'public sphere' is suffused with forms of moral practice and mundane actions. These practices are often hidden from view in traditional accounts of identity, political change and the public sphere. This is consistent with ethnomethodological approaches to the conceptualisation of social structure as a members phenomenon (Boden and Zimmerman, 1993). In this case, a particular aspect of social structure, namely nation. In addition to the above it is our contention that studies that seek to examine national identity in terms of talk and interaction are able to make a unique contribution to the understanding of how national identity is mobilised as a resource for various forms of claims making, reality work, the making of distinctions and various other forms of accounting procedures. In short, the examination of national identity in terms of categorisation work renders visible the inference making machinery that the culturally 'hard wired' device of nationality makes possible. Furthermore, the investigation of the mundane conversational and interactional mechanics of such work opens up new possibilities for examining the interactional and social character of 'differences' as they are worked up and deployed in situ. Whilst this case deals with a debate concerning Wales and devolution (and the task of the programme is to generate debate) it nevertheless reveals and make visible cultural logics, forms of categorisation and identification that can be possibly tied or seen to be connected to the devices of Wales and devolution. To this extent the analysis reveals members understandings of national identity in a unique and lived format as opposed to interview or focus group (although these methods can and do provide interesting and relevant data with respect to issues of national identity). This study, we believe, goes some way to appreciating, as a social phenomenon, national-identity in action. There are, and must be, a very large number of situations and contexts within which national identity categories are mobilised and utilised as a resource, not only for making claims or accounting for phenomena (or promoting a democratic form of governance for Wales) but also for reaching particular types of decisions. Indeed, in some cases, these decisions may well be of a prejudicial nature. As noted earlier, similar devices of identity may be built up through the use of very different and sometimes contradictory modes of predication. Furthermore, a particular form of national identity may vary considerably within different settings, contexts and activities. National identity is socially accomplished and occasioned. Furthermore, through the analysis of talk-in-interaction (and the examination of identity work in interaction) this observation can be developed and fleshed out in order to document and describe the precise processes through which such social configurations are not only achieved but also maintained. Whilst the practical and applied consequences of such a grounded understanding of members national identity work is not a direct concern of this paper it seems to us that an understanding of the local accomplishment of identity at this level is very important in combating prejudice and developing pedagogical approaches sensitive to other cultures and changes being brought about by globalisation. At the most fundamental level an understanding of this form of interactional work will also enable us to question the mundane logic of prejudice and discrimination. Furthermore, such understanding may help to institute programmes and forge new concepts that promote inclusive (as opposed to exclusive) forms of identity in a rapidly changing world. 1 The following notation identifies the participants. Host: H, Caller: C, Studio guests: G1 and G2. 2It may be seen here that the question is addressed by the host to the guest (G2) who is in favour of devolution and for Wales. Thus one way to continue with the organisation of the programme along the lines of 'for and against' category pairs is through the opinion category of the caller being related to the turn organisation by addressing the caller's question to the guest who occupies an alternative topic opinion. The following conventions, developed by Gail Jefferson, were used for my transcripts. These conventions denote lapses in time, overlapping talk, pace and in some instances pitch, pronunciation and stress. I have only included those symbols used in my transcriptions. Numbers in Parentheses: e.g. (1.0) denotes the approximate duration pauses or gaps between utterances in seconds or tenths of seconds. Point in Parentheses: (.) indicates a 'micro - pause' of less than two tenths of a second. Letters, words or activities in parentheses: (cough) sounds, words or activities that are distinct or difficult to locate to a particular interlocutor (s). Square Brackets: [ ] mark the points where talk overlaps. Full Colons: ( : : ) denote an extension in the vowel or consonant sound in the utterance of a word. Emphasis: (CAPITALS) indicates specific emphasis and change in volume. Underlined word: ( as we said) indicates pitch change. Equals signs: = identifies a 'latching' between utterances, whereby which utterances follow each other rapidly after a preceding utterance. ACHARD, P. (1993) Discourse and social praxis in the construction of nation and state. Discourse and Society, 4, 75-98. BAKER, C.D. (1984). The search for adultness: membership work in adolescent-adult talk. Human Studies, 7, 301 - 323. BODEN, D. and ZIMMERMAN, D.H. (1992) (Eds.) Talk and Social Structure. Oxford, Polity Press. CONDOR, S. (1999) Pride and prejudice: Identity management in English people's talk about 'this country'. Discourse and Society, 11, 2, 175-205. CLAYMAN, S.C. (1992) 'Footing in the achievement of neutrality: the case of news-interview discourse. In P. Drew and J. Heritage (eds.) Talk at Work. Cambridge: Cambridge University Press. FEVRE, R. and THOMPSON, A. (1999). Nation, Identity and Social Theory: Perspectives From Wales, Cardiff, University of Wales Press. HESTER, S. 1994. 'Les categories en contexte'. Raisons Pratiques, 5:219-43. Special Issues title 'L'Entquite sur les Categories: de Durkheim et Sacks', (ed), B.Fradin, L'Qu�r� and J.Widmer. Editions de l'Ecole des hautes Etudes en Sciences Sociales, Paris. HESTER, S. and EGLIN, P. (1997). Culture in Action: Studies in Membership Categorization Analysis. International Institute for Ethnomethodology and Conversation Analysis and University Press of America, Washington, D.C.
HESTER,S and FITZGERALD, R. (1999), Category, Predicate and Contrast:Some Organisational Features in a Radio Talk Show in P. Jalbert (ed.) Media Studies: Ethnomethodological Approaches. University Press of America and International Institute for Ethnomethodology and Conversation Analysis . HESTER, S. and FRANCIS, D. (forthcoming). The Institutional Talk Programme: Ethnomethodology Institutionalised? TEXT (awaiting issue). HESTER, S. and HOUSLEY, W. (2001). Language, Interaction and National Identity. Aldershot, Ashgate. HOUSLEY, W. (2000). Category Work and Knowlegeability within Multidisciplinary Team Meetings. TEXT, 20:1, 83 - 107. HOUSLEY, W. (2001, forthcoming). Moral Discrepancy and 'fudging the issue' in a radio news interview. Sociology (awaiting issue). HUTCHBY, I. 1991. 'The organisation of talk on talk radio'. In P. Scannell (Ed.) Broadcast Talk. London, UK: Sage. JAYUSSI, L. in Button, G. 1991. Ethnomethodology and the Human Sciences. Cambridge, Cambridge University Press. LEPPER, G. (2000). Doing Categorisation Analysis: A Practical Guide. London, Sage. LEUDAR, I and NEKVAPIL, J. (2001) 'On Dialogical networks: Arguments about the Migration Law in Czech Media in 1993', in S. Hester and W. Housley (eds) Language, Interaction and National Identity. Aldershot, Ashgate. LYNCH, M. and BOGEN, D. 1996. The Spectacle of History. Durham and London, Duke University Press. RAPLEY, M. and AUGOUSTINOS, M. (2001) 'National Identity as a Rhetorical Resource', in S. Hester and W. Housley (eds) Language, Interaction and National Identity, Aldershot, Ashgate. SACKS, H. 1992 a,b. Lectures on Conversation, Vol I and II. G.Jefferson (Ed) with introduction by E.A. Schegloff. Oxford, Basil Blackwell. SILVERMAN, D. (1998). Harvey Sacks: Social Science and Conversation Analysis. Oxford, Polity Press. WATSON D.R. (1997). Some general reflections of category and sequence. In S. Hester and P. Eglin (Eds) Culture in Action: Studies in Membership Categorization Analysis, (49-75). International Institute for Ethnomethodology and Conversation Analysis and University Press of America, Washington, D.C.
WATSON, D.R. (1978). Categorisation, Authorisation and Blame Negotiation in Conversation. Sociology (12 (1): 105 - 13). WIDMER, J. (2001) 'Symbolic Power and Collective Identifications', in S. Hester and W. Housley (eds) Language, Interaction and National Identity. Aldershot, Ashgate.